When we make hog roasts we make them so good that they can’t be refused. The taste, the texture, the alluring appearance and enthralling aroma, it’s these qualities in every hog roast in Bala and spit roast that we cook that make the proposition of Spitting Pig catering so exceptionally enticing. And it’s for that same reason that you want to find out so much more about our hog roast Shrewsbury services and get in touch with us so that we can give you a free quote and book your event. Hog roasting at your event is only a phone call away. You can book for a hog roast in Rhos to be ate outdoors or indoors. 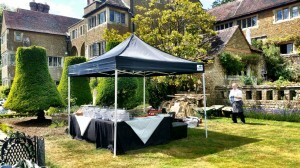 When we cater at your event indoors or out it’s always safe. Hog roasting can be unsafe if the hog roast is made in unventilated, small spaces, but we’re health and safety compliant caterers and have our own requirements that we adhere to. Before we cater at any event we require that the venue where we’ll be hog roasting is ventilated well. In some cases, if there isn’t enough ventilation in a room, we can hog roast in Bangor in other rooms in the venue, or hog roast outside and bring the food in after cooking to serve. You can learn more about our safety commitments and hog roasting requirements by calling us. It takes quite a long while to fully cook the pig, but we’ll always prepare and cook a hog roast so that we can serve at the agreed time. To do this we go out of our way to get to the event venue as early as we need to – and that could be 3 hours or 9 hours. The amount of food that needs preparing and, most important of all, the weight of the pig that we’re cooking is how we will determine just how early we’ll need to be at the venue to start the cooking process. If for some reason there will be an issue with our arriving at your venue so early then we can instead partially spit roast the pig beforehand, finishing it at the site and serving. There’s a variety of menus on our menu section of the website and before calling us it’s best to find at least one menu you like so that we can give you your free quote. If you can’t decide on a menu straight away then we’ll happily discuss with you over the phone your options and try to help you make a choice that will best benefit your event. There are also extras to many of our menus that can be added on when you’re booking. For example drinks bars can be included with any menu that you choose. We have the trained staff who will professionally work the drinks bar so that your guests have the most fun and friendly service. The only requirement of our drinks bar service is that you provide the drinks for us to serve. Another addition for menus is the providing of a Spitting Pig employee to act as the front of house at your venue, or the serving of drinks and canapes on the arrival of your guests. With the wedding menus these options are usually included as part of the hog roast Snowdonia menu. You can also call or email us, or use our internet form, to get a quote for a Spitting Pig hog roast in Carmarthen or spit roast machine. We build our machines with the best materials and machinery that there is, the quality of a Spitting Pig machine is very high, and apart from being built with great materials and new technology they’re finished with fantastic stainless steel, so that not only do they get the job done but they look the part also. You can hire multiple machines for your event occasion or business. The great benefit of hiring 2, or even more, machines is that you can then cook multiple spit roasts, so that your guests get a great amount of choice, just like they would if you were to book our Spitting Pig catering. There are different sized machines and we’ll tell you more about which machine we think is best for you when you ring up to discuss your options.